Our company is a well known Manufacturer, Supplier and Exporter of Gunite Machine from Mumbai, Maharashtra. Our Gunite Machine comprises of components like twin chamber gun, twin water tank, sand blasting nozzle and Air Motor for its smooth and efficient running. To ensure customer satisfaction, we make sure that all our machines are fabricated within industrial norms and tested as such. 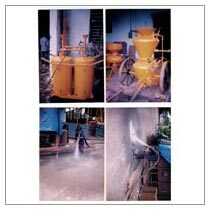 Customers can contact us for ordering bulk quantities of Gunite Machine at reasonable prices.